What’s that? You don’t want to drive six hours for a 1,530 foot mountain? Oh, sure, there are plenty of worthy mountains in the Northeast. Many that are bigger, tougher, and (likely) closer. But how many of them are in scenic Acadia National Park? How many of them sport the highest point on the North Atlantic seaboard, and are amongst the first places in the United States to see sunlight? How many of them offer views not only of surrounding mountains, but also of Frenchman’s Bay and its spattering of islands and cruise ships? A Google images search will quickly have your heart pining for Cadillac Mountain, making it the hiking version of Jessie’s Girl. Cue the Rick Springfield, it’s time for a road trip! I roped the Mrs. into this one under the guise of an anniversary Bar Harbor getaway. It was a good plan, too, until it started raining shortly after our arrival. And continued to do so. All. Freaking. Weekend. Unlike our hiking boots, however, our spirits couldn’t be dampened. 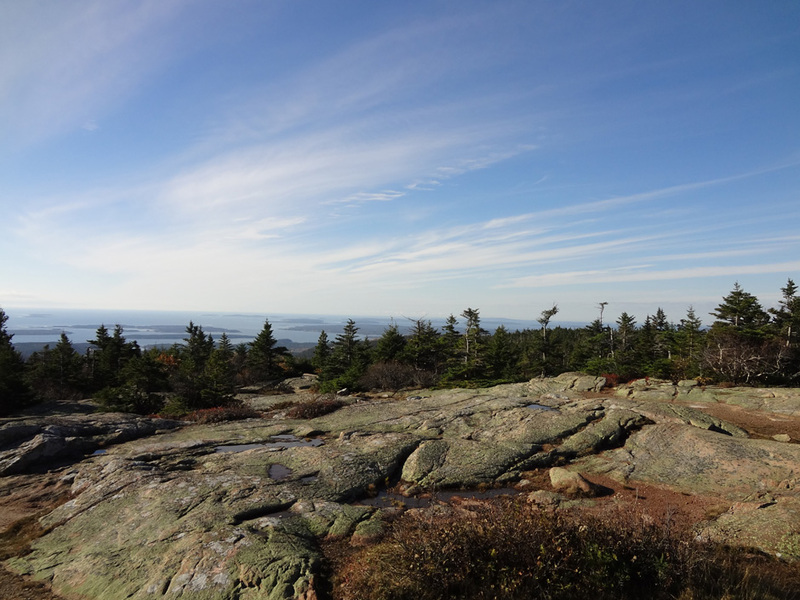 At 3.5 miles the South Ridge Trail is the longest direct approach to the Cadillac Mountain summit. After admiring this mountain beauty from afar, why not pick a slow song to ask her to dance? Below treeline the trail guides visitors through a rich coniferous forest, a pleasant escape from the crowds likely to be encountered on top. As one would expect of a national park, the trail is well maintained. There’s a stretch comprised of buried sandbags to combat erosion, and places with stone staircases are perfectly spaced for little feet. A mile into the hike is the short Eagle Crag Loop Trail sporting a lookout with an easterly view perfect for early birds trying to catch a sunrise. Assuming the clouds looked the same on the crag as they did the summit, we skipped this detour and had a little photo fun on a nearby cliff instead. Shortly after the cliff the trail emerges above treeline on an open ridge, providing postcard-quality views from here to the summit. Except, you know, when it rains. Along the way there are multiple intersections with the Jordan Ponds Path, Canon Brook Trail, and Cadillac West Face Trail. All are well marked—just make sure to read signs carefully in foggy weather. We also saw a lot of this bluish gray fungus on the rocks. Not sure what it’s called, but it’s slippery when wet. A rock climb at the tail end of the hike presents the only real challenge. Even so, it’s short enough to be a fun obstacle for kids. Don’t let Cadillac Mountain’s 1,530-foot summit fool you, its close proximity to the ocean can lead to strong winds and harsh conditions. This should go without saying, but…if you’re in the park and considering a spur-of-the-moment hike, make sure to bring layers. Posting unflattering photos of your wife on the summit can also lead to cold shoulders. Above I mentioned that it rained the entire weekend we were in Bar Harbor, which isn’t entirely accurate. On the morning we were leaving we woke up to the following view from our hotel room. So…on our way out of town we cheated and drove to the top of Cadillac Mountain to get a few good shots. Travel south on U.S. Route 3 from Bar Harbor Village. The trailhead is located on the right just after the Blackwoods Campground road. Acadia National Park maps indicate a parking area at the trailhead, but don’t bother looking for a lot, it’s all roadside. Those staying at the campground can take the connector trail to the Route 3 trailhead for an additional 0.7 mile hike (one way).